Grand Duke Nicholas Mikhailovich of Russia (Russian: Великий князь Никола́й Миха́йлович, 26 April 1859 – 28 January 1919) was the eldest son of Grand Duke Michael Nikolaevich of Russia and a first cousin of Alexander III. A scholar and an eminent historian, he made many valuable contributions to the study of Russian history in the reign of Tsar Alexander I. His works, published in Russian and French, include: diplomatic documents of Tsar Alexander I and Napoleon; a life of Tsar Alexander's close friend, Pavel Strogonov; and biographical studies of Alexander I and his wife Elizabeth Alexeievna. A political liberal, he veered towards what he called "authoritarian republicanism". He fought tirelessly for reform from within the system. His reformist views made him an oddball within his own family, and contemporary recognition of his accomplishments came more from abroad than at home. He was a member of the French Academy, Honorary Doctor of History and Philosophy from the University of Berlin, Honorary Doctor of History from Moscow University, and President of the Imperial Russian Historical Society, the Society of Pomology and the Russian Geographic Society. He fell from favour during the last part of the reign of Nicholas II, as Empress Alexandra disliked him for his liberal views. As the political situation in Russia worsened, he urged the Tsar to implement reforms, and he even participated in discussions of a palace coup. After the fall of the monarchy, he was exiled to Vologda. He was later imprisoned by the Bolsheviks in Petrograd and shot outside the St Peter and St Paul Fortress along with his brother Grand Duke George Mikhailovich and his cousins Grand Duke Dimitri Konstantinovich and Grand Duke Paul Alexandrovich. Grand Duke Nicholas Mikhailovich was born on 26 April 1859 at the Alexander Palace in Tsarskoye Selo, the eldest of the seven children of Grand Duke Michael Nikolaevich of Russia and his wife Grand Duchess Olga Feodorovna of Russia, born Princess Cecilie of Baden. Known in the family as "Bimbo", he was three years old when in 1862 the family moved to Tiflis when his father was named Viceroy of the Caucasus. Nicholas spent his childhood and youth in Georgia, where the family lived for twenty years. He received a Spartan upbringing. His father was preoccupied with governmental and military matters and remained a distant figure. His mother was a strict disciplinarian and the dominating figure in the family. Nicholas was his mother's favorite son; they had a close relationship as reflected in their surviving letters, which have Oedipal overtones. Growing up in the Caucasus, the Mikhailovichi, the junior branch of the Romanov dynasty, were raised in an atmosphere far removed from their cousins in the Imperial capital, and would later be regarded as more progressive and liberal minded than the other Romanovs. The sons of Grand Duke Michael Nikolaevich were educated by private tutors and Nicholas, a gifted student, soaked up their instruction. From his youth he was interested in art, literature, architecture and scientific matters. However, as with all male members of his family, Nicholas was expected to follow a military career. In Tiflis, he commanded a battalion of the Caucasian Archers in 1877, and fought alongside them in the Russo-Turkish War, 1877–1878. This experience was traumatic and made him a pacifist for the rest of his life. When his father was appointed President of the Council of the Empire in 1882, the whole family returned to Saint Petersburg. Nicholas was assigned to Marie Fyodorovna's Horse Guards Regiment. In 1879, when Grand Duke Nicholas Mikhailovich was 20 years old, he visited the court of his maternal uncle, Grand Duke Friedrich I of Baden, and fell in love with his cousin, Princess Victoria of Baden. "She is charming and pleases one immediately", he wrote, adding, "She kisses you and makes you say a thousand things". The Russian Orthodox Church, which prohibited first cousins to marry, would not permit any thought of marriage. Nicholas nevertheless asked his uncle Alexander II to allow the wedding, threatening that if he were not allowed to marry Victoria of Baden, he would never marry. Permission was not granted; Princess Victoria eventually became Queen of Sweden. Nicholas tried to find a royal bride for a second time in the 1880s. He was interested in Princess Amélie of Orléans, the eldest daughter of Prince Philippe, Count of Paris. Nicholas described her as "beautiful and large of stature, beautiful eyes, but not very pretty all the while a beautiful person". He asked his parents' permission to marry her, but she was Catholic and her family was unwilling to allow her to convert and they were also eager to marry her to King Carlos I of Portugal. Nicholas Mikhailovich never came close to marriage again. Instead he channeled his energy into scholarly pursuits and the management of his several grand residences and estates, which gave employment and lodging to thousands. He was highly conscientious of his responsibility for the welfare of those who relied upon him for their livelihood. In his mature years little of his attention seems to have been directed toward women save that he mentions in a letter of 1910 that he had fallen in love again, as if by some miracle, "imagine that, in love at fifty one". But this one and only mention of anything of the kind in all of his correspondence suggests this flight of fancy did not go far, and that his feelings were unrequited. One of his greatest female friends was Princess Elena (Nelly) Mikhailovna Baryatinskaya. She was older than he was and was typical of the highly dignified and platonic relationships that were the norm among most of the Imperial family. Nicholas Mikhailovich had no real military talent or inclination towards army life. He loved education and begged his father to allow him to enter the University, but Grand Duke Michael Nikolaevich was firmly opposed. To please his father Nicholas entered the Academy of the General Staff (War College) where he excelled in his studies. Military life was not for him as he much preferred studying butterflies and historical research. Entering the military, as all Romanovs did, the grand duke eventually became hostile towards it and was in fact the only family member ever to formally leave military service. From his youth in the Caucasus, Nicholas developed an interest in botany. He also gathered a highly regarded collection of rare butterflies, which he later gave to the Academy of Sciences, and at that same time published a ten-volume work entitled Discussions on the Lepidoptera. Other natural scientific interest drew his attention, pomology in particular. He was named President of the Russian Society of Pomology and developed a seedless tangerine. During World War I, Nicholas Mikhailovich also published a book on hunting, demonstrating his scientific interest in geese and ducks. Soon he became more interested in historical research. His first book, "The Princes Dolgoruki, Collaborators to Emperor Alexander I", appeared in 1890. Many other books would follow, including five volumes of Russian portraits from the eighteenth and nineteenth centuries. It consist of portraits of figures from the reigns of Catherine the Great, Paul I, and Alexander I. This monumental work of original photographs from palaces, museums and galleries is an important source of information as many of the originals have been destroyed by war and revolution. In 1905, Nicholas left the military and pursued his research interests full-time. 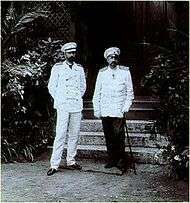 Nicholas II happily granted him unlimited access to the Romanov Family Archives and Library. The grand duke soon published multi-volume works (over fifteen in all), in both Russian and French, on the reign of Tsar Alexander I. This important work brought him international recognition across Europe. His works include: diplomatic documents of Tsar Alexander I and Napoleon; a life of Tsar Alexander's close friend, Paul Strogonov and biographical studies of Alexander I and his wife Elizabeth Alexeievna. While Nicholas Mikhailovich's scholarly works were admired by professional historians and French literary figures, he did not find the same reception among the great Russian historians of his day, such a Vasily Klyuchevsky. However, even the future Soviet scholars valued his works: he is the only one of three non-ruling members of the Imperial family to receive an entry in the Great Soviet Encyclopedia. His historical works were never far from his mind no matter what he was doing. His letters, especially those to the French historian Frédéric Masson are mainly reports of his historical endeavors, which were never ending. During the First World War, he finished a seven volume study of Relation Diplomatiques 1808–1812 as well as the second Russian edition of Alexander I in two volumes in 1915. He had an almost childlike energy about his research and new discoveries, and his enthusiasm knew no bounds. Because his education was not the most conventional, his first work in history was dilettantish. He dabbled in topics, but he improved considerably with time. When the Imperial Historical society called him to write several articles for their bibliographic dictionary, he developed a passion for writing. His position in the ruling family gave him access to archival materials that were inaccessible to the public, and he had the privilege of having these items delivered from the state archives to his home where he could work on them in the comfort of his own study. He also accumulated an extensive library, both in his St Petersburg palace and in his rural estate, Borjomi, where he liked to work undisturbed. His great wealth enabled him to have a number of research assistants, a luxury seldom available to most historians. His most valuable helper with his historical work was Constantine Brummer, his aide-de-camp since the earliest years of his military career who was his loyal friend until the end. In 1892 when the presidency of the Geographic Society fell vacant, Nicholas Mikhailovich became its president. He never published any scholarly works in this discipline. In 1909, he became president of the Historical Society; by then, he was already a well-regarded historian. He took this post seriously and his involvement was extensive even during the war years. In May 1914, Grand Duke Nicholas created an Archival Commission to coordinate and give assistance to local historical archives; but World War I intervened, and archival reorganization had to await Soviet efforts. In 1916, he was occupied with the jubilee of the society and was planning the centennial celebration of the birth of Tsar Alexander II, which was going to take place in April 1918. Nicholas Mikhailovich gathered an important collection of historical artifacts, mainly pictures and miniatures of prominent figures. He also collected French objets d'art and took a special interest in the works of Jacques-Louis David. He acquired, among others, one of David's portraits of Napoleon, which remained with him until after the revolution. He first hid it in the basement wall of his palace and then smuggled it out of Russia from Finland to the West. The grand duke also planned art shows like one he organized in 1905 in the famous Tauride Palace, with pieces never before displayed. Nicholas Mikhailovich was tall at 6' 3" (190 cm), and a beefy frame, with dark eyes and a short dark triangular beard. He became bald early in life and, in later years, heavy set. He loved children, and although he never married, according to his niece, Princess Nina, he fathered several illegitimate children. Moody and eccentric, he had an acerbic and cynical nature. He also had a sharp wit and a keen, sometimes childish, sense of humor. His pranks and jokes endeared him to his family. He considered himself as a socialist, holding liberal political views. His behavior, along with his stubborn insisting on always speaking his mind, did not endear him to the Imperial family, and it was his charm and humor which often alleviated their anger toward his beliefs. This label of "liberal" was only further supported by his open and easy nature. The grand duke considered the men in his regiment to always be his equals, and addressed them as "my friends". He was uneasy about class pretensions and especially the idea of being "above" the men, yet his soldiers loved him deeply and praised him loudly. He would receive intellectuals from across the political spectrum and have long engaging discussions and correspondence with them. His passion for Russian history and butterflies, his genuine scholarship, along with his love and respect for France and its political systems made him an atypical Romanov. His liberalism did not prevent him from writing to Leo Tolstoy to protest a pamphlet the famous writer was distributing containing what the grand duke considered an unfair and inaccurate criticism of his grandfather Nicholas I. Widely considered an eccentric, he was well regarded by many family members including Empress Maria, who valued his opinions. Nicholas traveled extensively; he often visited Paris and the south of France where he reunited with his brother Michael and sister Anastasia. Nicholas was fond of gambling and lost large amounts at the casino in Monte Carlo. He was famous for his indiscretions, disclosing confidential information about politics in Russia to his friends or in conversation at reunions. These got him into trouble more than once. An ardent Francophile, he offended Germany during a visit to Paris when he expressed his anti-German political views, which caused a diplomatic protest. Upon his return to Russia, Alexander III exiled him for some months to Borjomi, his family's rural state. Very outspoken about his ideas, he begged Nicholas II to cancel the coronation ball at the French embassy in Moscow following the Khodynka Tragedy, warning him that holding it would create a perception of monarchical indifference such as had made Marie Antoinette unpopular. When it was held nevertheless, he arrived with his brothers, then departed soon after in protest. His manner could turn caustic. The Imperial family always said he had a mean and critical tongue. He loathed Grand Duchess Maria Pavlovna and her family, the Vladimirovichi. 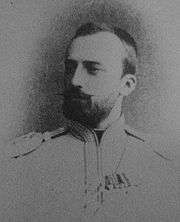 A vehement critic of most of his male cousins, Grand Duke Nicholas Nikolaevich in particular, Nicholas Mikhailovich was a divisive figure among the Romanovs. 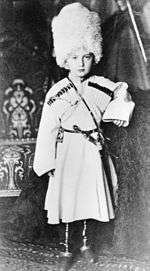 At the death of his father in 1909, he became the head of the Mikhailovichi branch of the Romanov family and inherited great wealth. He received all of the lands and houses of his father: Borjomi, his large rural estate in Georgia where he enjoyed living and preferred to work; Mikhailovskoe outside St Petersburg; an enormous palace on the Neva in St Petersburg, and the great estate Grushovka in southern Ukraine. His primary residence was the palace on the Neva, which was so large that his brother Grand Duke Sergei, who lived with him, used a bicycle to go from one side to the other. Between his two residences in the capital region, he employed more than 400 servants. 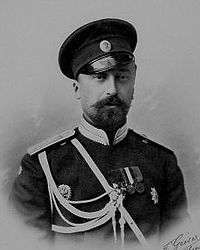 At the outbreak of World War I, Nicholas Mikhailovich joined the war effort with the formal title of aide-de-camp general, which was an honorific post. He had not been in active service for a decade and was not given a field command. Instead, he was sent to the southwest front facing the armies of the Austro-Hungarian Empire. Stationed in Kiev in August 1914, he moved later to Rovno. He did not interfere with military matters but was assigned to make visits to hospitals. Within just a few days, at the end of August 1914, 6,000 wounded soldiers passed through Rovno alone. Nicholas was horrified by the slaughter "I have seen such suffering, such abnegation", he wrote, "that my heart has stopped, suffocated by the horrible spectacle of human suffering". His work with the army had a profound impact. "The suffering of the injured tears my heart," he wrote. Daily he visited the hospitals and "the masses of wounded". He remained in this position until his hospital visits became less necessary in 1915. However, this experience left him embittered: "there is every reason to become socialist after these massacres", he said. After the terrible Russian defeat in East Prussia in the Battle of Tannenberg, the Grande Duke prophetically wrote "in all Russian military disasters comes a gigantic uprising, which would bring to an end many monarchies and the triumph of international socialism". During the war, his opinions in military matters were in the antipodes of his cousin Grand Duke Nicholas Nikolaevich, who was commander in chief of the Russian armies between 1914 and 1915. Nicholas Mikhailovich disliked his cousin from their youth when they were rivals in their military careers. He was a pacifist and was against the war in a time of uppermost patriotism. He criticized his cousin's strategy and tactics, particularly the sacrificing of the Imperial guard and a large part of the regular army in the ill-fated advance on East Prussia. He foresaw that Russia would not win the war with only half-trained reservists and draftees. Worried with what was happening in the Russian government, the grand duke sent a letter to Nicholas II begging him to deprive Empress Alexandra of power and a sixteen-page tract on the misdeeds of the prime minister, Stürmer. Horrified by the actions of the Government at this time, he publicly lambasted their actions. So much so that by the end of 1916 Nicholas II finally lost his patience with him and exiled Nicholas Mikhailovich to his rural estates. The grand duke did not return to Petrograd until he freed himself from exile after the fall of the monarchy. He had little faith in the provisional government, feeling that nothing short of a miracle could save Russia. After the October Revolution he was initially undisturbed by the Bolsheviks. He remained in Petrograd thinking, as many did at the time, that they would not last in power. He hesitated about escaping from Finland to Denmark, where his niece was queen. This would ultimately cost him his life. In January 1918, the Bolsheviks occupied his palace. He was initially allowed to continue living in his own apartments at the palace, but soon after he was expelled. From left: Grand Duke Nicholas with his brothers Michael, George and Sergei at Cannes. The following month all members of the Romanov family still living in Petrograd were ordered to register with the dreaded Cheka, the Soviet secret police. It was then decided that they would be sent to internal Russian exile. Nicholas Mikhailovich was sent to Vologda. On 30 March 1918, the grand duke departed by train to his destiny in the company of his personal cook and his close friend and assistant Brummer, who had insisted on going with him in spite of the Grand Duke's protestations. The following day they arrived at Vologda. Nicholas Mikhailovich and Brummer were lodged with a young couple in a two-room house. Initially he could move freely around town. His brother George and his cousin Grand Duke Dimitri Konstantinovich had also been exiled to Vologda and they visited each other frequently. Allowed to do as he pleased so long as he remained within the city limits, the grand duke occupied his time reading. 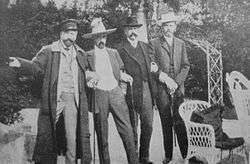 On the morning of 14 July, two days before the murder of Nicholas II and his family, a car with four heavily armed men arrived and collected the Grand Dukes from their lodgings. They were arrested and interned in a small, walled village prison where they could be more easily guarded. Brummer was not allowed to accompany them. Nicholas Mikhailovich's cell was a large room with windows that looked out onto the courtyard. He had a camp bed that he had brought with him. He was treated well by his jailors. The French government tried to intercede on his behalf as a member of the French Academy. Brummer, his faithful assistant, tried also to gain the grand duke's release, but he could only visit him in prison. On 20 July, Brummer informed the prisoners of Nicholas II's assassination. This seemed to indicate the worst. The following day, 21 July, all of the exiled grand dukes in Vologda where transferred back to Petrograd. In the former Imperial capital, the men were quickly imprisoned with six other detainees in a cell at Cheka Headquarters. Upon arrival, the grand dukes were questioned at length by Moisei Uritsky, the Chairman of the Petrograd Cheka. The prisoners were photographed and then moved to the Kresty prison. Shortly thereafter, they were transferred to Shpalernaya prison, where they would remain for most of their incarceration. Here each had his own private cell, if only seven feet long and three feet wide. Their only furniture was a hard iron bed. The grand dukes were permitted to exercise a half-hour to forty-five minutes twice a day, although the personal contact allowed in Vologda was denied them here at first. Their wardens, all of whom were soldiers, treated them well. After several days, the prisoners were allowed to gather in the courtyard and were permitted some provisions from the outside such as fresh linens and cigarettes. Their day began at 7:00 am when they were awakened by the steps in the hall of their jailors and the clank of their keys in the door. Lunch was served at noon, which consisted of dirty hot water with a few fish bones in it and black bread. The lights were turned on in the cells at 7:00 pm, although as the winter approached the prisoners had to sit in darkness until that time. The meetings of the Grand Dukes during exercise gave them opportunity to exchange a few words. Brummer, Nicholas’ faithful adjutant, followed Nicholas Mikhailovich to Petrograd and visited him at Shpalernaya prison. The secretary of the French embassy was also concerned with his well being. Some of the grand dukes' relatives made frantic efforts to obtain their release through Maxim Gorky who was sympathetic and asked Lenin to set them free. Gorky ultimately obtained Lenin's signature for the grand duke's release. He rushed to return to Petrograd to have them freed. On the platform however, he picked up a newspaper whose headline rang out, "Romanovs Shot!". Brummer, who had heard rumors that the grand dukes had been condemned to death, only learned the tale of the grand duke's murder years later. In exile in Paris, he encountered the grand duke's bailiff who told him what had happened. The Romanov Palace in Likani commissioned by Grand Duke Nicholas in the 1890s now serves as a summer residence of the President of Georgia. At 11:30 pm on the night of 27–28 January 1919, guards awoke Nicholas Mikhailovich, his brother George and his cousin Dimitri in their cells at Shpalernaya prison, telling them they were to be moved and had to pack their belongings. They initially assumed that they were going to be transported to Moscow. Grand Duke Nicholas Mikhailovich even thought that they might be set free, but his brother assumed that they were heading to another place to be shot. They had an ominous hint of what was going to happen to them when at the time of departure they were told to leave their luggage. The grand dukes were taken outside and loaded into a truck that already held four common criminals and six Red Guardsmen. At 1:20 am on 28 January, they left the prison. They drove towards the river by the Field of Mars, where the truck stalled. While the driver was trying to restart it, one of the convicts tried to run and was shot in the back as he fled. The truck eventually began running again, and they drove to the Peter and Paul Fortress. The prisoners were roughly pushed from the truck into the Trubetskoy bastion. They were told to remove their shirts and coats, despite the fact that it was almost -20 °C. By then they had no doubt about what was about to occur and the grand dukes embraced each other for the last time. Different soldiers appeared carrying another person, whom the grand dukes finally recognized as their cousin Grand Duke Paul Alexandrovich. They were then each escorted arm in arm with a soldier on each side towards a trench that had been dug in the courtyard. As they passed the cathedral of Saint Peter and Saint Paul where their ancestors were buried, the grand dukes crossed themselves. The prisoners were lined up before the ditch, in which there were already thirteen bodies. Nicholas Mikhailovich, who had been carrying his cat, handed it to a soldier, asking him to look after it. All of the grand dukes faced death with the greatest courage. George and Dimitri prayed quietly. Grand Duke Paul, who was very sick, was shot on a stretcher. Grand Dukes Nicholas, George and Dimitri were killed by the same blast. The fusillade of shots sent them reeling into the ditch. 1 2 Cockfield, White Crow, 2002, p 62. 1 2 Cockfield, White Crow, p. 73. Wikimedia Commons has media related to Grand Duke Nicholas Mikhailovich of Russia.